A great job has been announced for the graduates from the Faysal Bank. I am giving you full information about Faisal Bank's job in 2019. If you have a graduate degree and are looking for a job, you should apply for the Faysal Bank jobs. 35 jobs have been announced by Faysal Bank in which both men and women can apply from Pakistan. 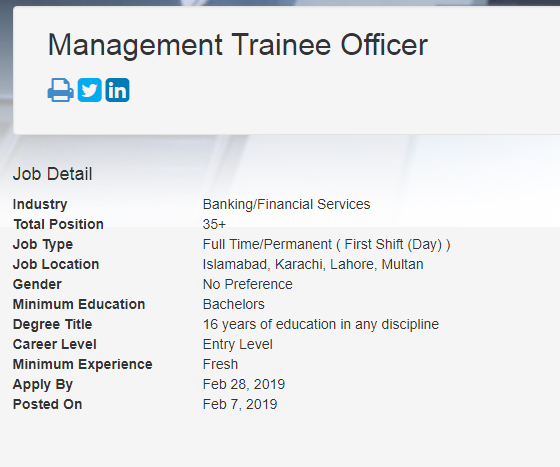 Faysal Bank Management Trainee Program 2019. Students From all over Pakistan are eligible to Apply. Fresh Graduates with NO Experience. There is no need for experience for the Faysal Bank Jobs 2019. This is a Full Time/Permanent Job. You will be given a salary of Rs. 30,000 a month. The Candidates will be placed in their respective cities. Your education for this job16 Years of education in any discipline from all local/international universities recognized by HEC. Minimum Education should be a Bachelors Degree. 16 years of education in any discipline from all local/international universities recognized by HEC. How to Apply for Faysal Bank job 2019?